LAHORE: (Thursday, September 6, 2018): Speakers at a ceremony organized by Punjab University have said that Pakistan Army and the nation were indispensible and no one could dare to look at us with bad intentions. 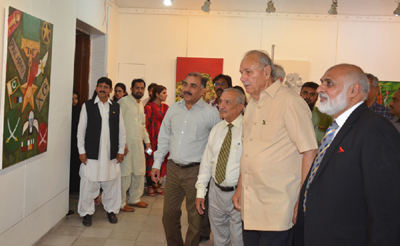 The ceremony was organized by PU College of Art and Design in connection with Defense Day celebrations at its Main Hall, Old Campus. 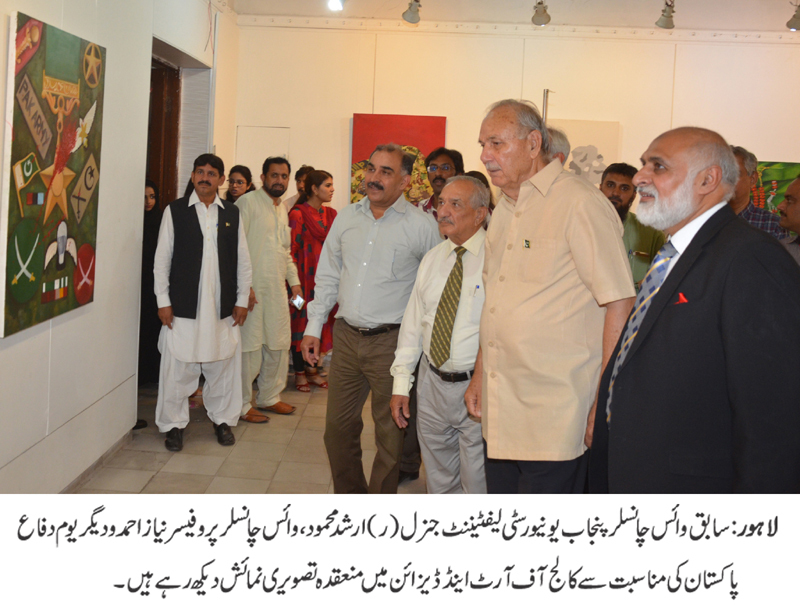 Former PU Vice Chancellor Lt Gen (r) Arshad Mahmood, PU Vice Chancellor Prof Niaz Ahmed, deans of various faculties, principals, faculty members and a large number of students participated in the event with zeal and zest. Addressing the seminar, Lt Gen (r) Arshad Mahmood said that he saw practical implementation of Quaid-e-Azam's message of unity, faith and discipline in 1965 war. He said that we defeated an enemy which was five times bigger than Pakistan. He said that Pakistan Army defeated Indian forces on all fronts. He said that during 1965 war, a bullet hit his leg but he refused to go to hospital and did not leave the battlefield because he had to defend the border. He said that our nation was full of ambitions and no Army could win war without the support of its people. He said that such activities keep the blood warm and must be organized on national days. He said that Pakistan Army was well-trained, well-polished and much superior to Indian Army. 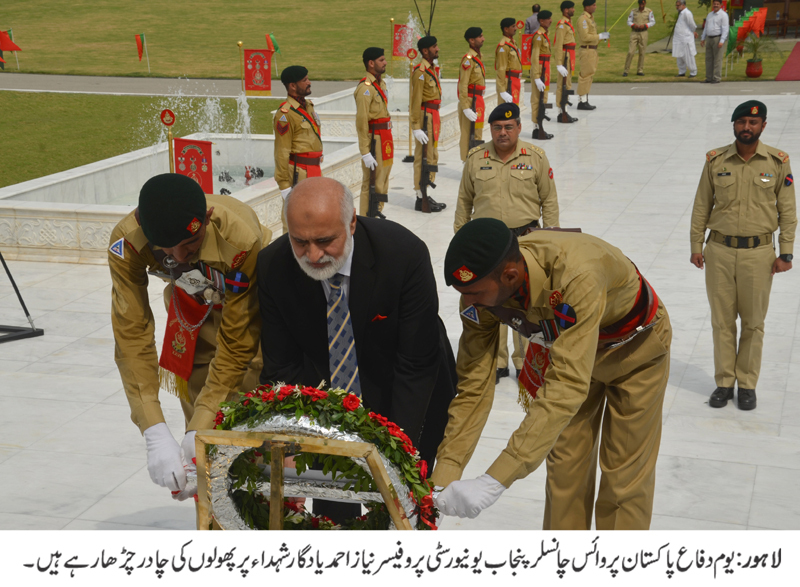 Addressing the ceremony, PU VC Prof Niaz Ahmed paid tribute to the martyrs of Pakistan Army. He said our Army had achieved unprecedented success in war on terror and no Army in the world had such success story to its credit. He said that Pak Army was No 1 army in the world and the whole nation stood with the Army. He said that our engineers and technologists were also contributing to make our defense stronger than ever. He said that the quality of our atomic program was at par with any developed country of the world. He said no one could defeat Pakistani nation as it was full of the ambition of patriotism. He said that we must play our role for the development of our country by recognizing the requirements of our country and understanding the necessities of the present age. He said that all the Pakistanis must excel and perform well in their fields. He said that PU would also play lead role in the development of country as it had major responsibility on its shoulders being the oldest university of the country. He also lauded the sacrifices of Lt Gen (r) Arshad Mahmood for defending the borders of the country and his services for uplifting Punjab University. On the occasion, students presented national songs and documentary in connection with Defense Day celebrations, which attracted a huge applause from the participants. PU VC Prof Niaz Ahmad announced Rs one hundred thousand cash prize for the students on their outstanding performance. 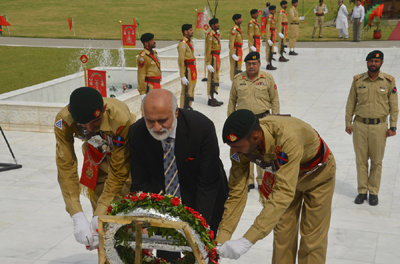 Later, the VC and others visited Yadgar-e-Shohda and laid floral wreath and offered Fateh for the departed soul.